The information provided here details on how to import goods to Australia especially import customs clearance procedures in Australia. What is the customs process in Australia to import? How is import cargo released from Australia Customs to importer? Who are the parties involved in import customs clearance formalities in Australia? Import cargo clearance in Australia Customs. The Australian Customs and Border Protection Service manage customs that facilitate the movement of legitimate international travellers and goods at the same time protect security and economy of the society. All goods imported into Australia must be cleared through the border. The Department of Home Affairs can provide you with information on importing goods, such as import clearance requirements, prohibited goods and import permits. Some goods may carry special restrictions or may even be prohibited from being imported. For example, if your goods contain industrial chemicals like cosmetics, solvents, adhesives, plastics, inks, printing and photocopying chemicals, paints, household cleaning products and toiletries, you will need to register your business with the Australian Government's National Industrial Chemicals Notification and Assessment Scheme (NICNAS) and pay registration fees. If your goods also fall under quarantine regulations, the Department of Agriculture and Water Resources will need to inspect and possibly treat them. Import customs procedures required in ADELAIDE. Import Customs process in S. Australia BELLBAY. Process to import to , Tasmania BRISBANE. Requirements of customs to import to , Queensland BROOME,.Customs requirements in W. Australia BURNIE, to import. Customs needed to import to Tasmania DAMPIER, . How can I clear customs to import in W. Australia DARWIN,. What Customs formalities required to import in N. territories FREMANTLE, . What should I do to import goods in W. Australia GERALDTON, . How to get import customs permission in Queensland HOBART, . 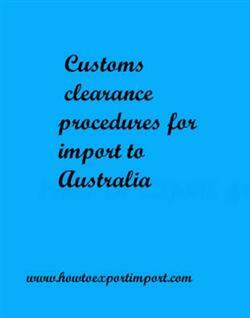 Procedure to get customs clearance to import in Tasmania MELBOURNE, . Mandatory process need to complete import in Victoria PORT HEDLAND. The way to get customs clearance process to import in Cairns. How to Import to Uruguay? How to export from Malawi? How to Import to Malawi?